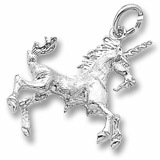 Charm of the week, Unicorn! Mother’s Day is coming soon, don’t forget to visit your local florist, and surprise her with a charm bracelet of her favorite charms? Charms and Charm Bracelets are great gifts for many age groups. Everyone has hobbies and interests. We have charms that represent many interests and hobbies. There are literally thousands to choose from, something for everyone. Charms can also be worn as pendant. We can add gemstones to many charms. They really are quite versitile, take a look next time you are in our store.